I remember (maybe through rose-tinted glasses?) choosing my first new bike in about 1958. Drooling in the bike-shop window & pouring over the catalogues. 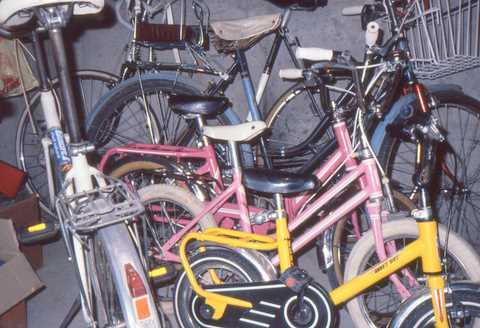 Bikes then were brightly coloured. The one I chose was mainly in metallic middle blue, with panels of light blue outlined by fine multicoloured lines. The bottoms of the forks were chromed, as were all the other steel bits. The frame joints were elaborate-shaped lugs, outlined for show. The rest was polished alloy. With white hand grips & brake-lever covers. I just ordered a new bike. For the frame, I had the choice between drab battleship grey & black. The just-announced 11-speed gear hub (critical factor in this purchase) is light alloy, but black. The alloy handlebars are - black. The extra-cost adjustable handlebar stem - black. Brake levers - you guessed it. Maybe I can find a red bell? Of course, I should have expected this. You only have to sample any crowd to see that 80-90% of people are wearing black, black & black. So I suppose bike manufacturers are just responding to current taste.